The Man Who Brought You Veep Is Turning His Satirical Gaze to MoscowTrust Armando Iannucci, who makes profanity into poetry, to find the hidden hilarity in murderous political upheaval. 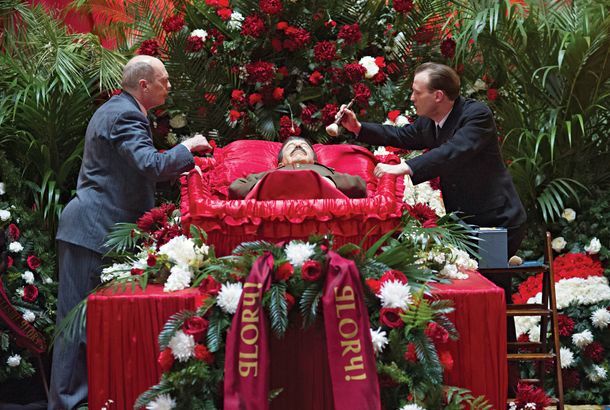 The Death of Stalin Walks the Line Between Satire and HorrorArmando Iannucci gets that grotesque horrors often emanate from egotists, clowns, and stumblebums, from small-minded people with unchecked powers. Jeffrey Tambor Removed From Death of Stalin Poster, Which Is Very SovietFollowing his firing from Transparent, Tambor was quietly removed from the poster for his newest movie. Dev Patel and His Hair Will Be in Armando Iannucci’s David CopperfieldHappy Valentine’s Day! The Death of Stalin Trailer: From Russia, With IncompetenceArmando Ianucci heads to Russia in his new dark comedy. Tambor, Buscemi Join Iannucci’s Death of StalinAs Georgi Malenkov and Nikita Kruschev, respectively. Showrunner Survey: Veep Boss Armando IannucciIn his alternate ending, things don’t get better for Ned Stark.